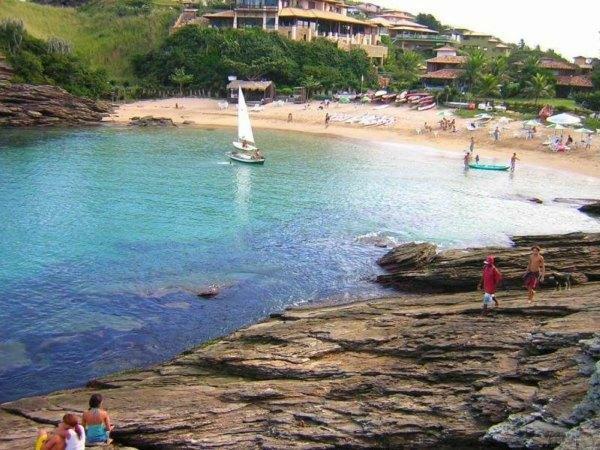 Sister to much larger Ferradura Beach, the charm of Ferradurinha in Búzios, will catch you by surprise. You can’t see it until you leave a narrow, walled path which discharges you right onto the sand. But little do you care, because paradise reveals itself in wonderful colored rock designs, cliffs, a sandy beach, and mansions overlooking the whole splendor. You’ll hear almost anything in Buzios, but a lot of it turns out to be true. 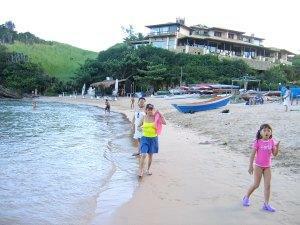 For example, this little beach IS a favorite among many Brazilian celebrities. And it is probably some of the clearest water in this area. In fact, you’ll find some of the younger kids actually spear fishing here around the rocky outcrops. Wild and lazy. The wind blows gently through the trees and unusual rock for- mations at Praia Ferra- durinha. The sea is like glass, meeting the beach dotted with fishing boats and umbrellas – I find myself in a painting… it’s not hard. Perfection abounds. 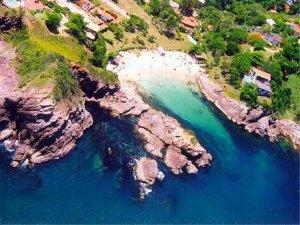 Actually, Búzios’ Ferradurinha Beach has been called a natural swimming pool between two cliffs. The water is warm near the beach, but runs deep quickly and is cold further out at the end of the rocks. The beach is located between Geribá and Ferradura Beaches. There is a small snack shop at the base of the foot path leading back to the parking area. You’ll find they carry mainly Brazilian snacks of grilled cheese on a stick, some seafood, drinks of all kinds, and of course, coconuts – so you can drink right out of the coconut. And what would be paradise without a nice beach umbrella? Ferradurinha Beach boasts a few, but they only take up the area close to the snack shop. If you want to lay out or make your space on the sand, there should be plenty of room between the shop and the spot where local fishermen pull their boats up. Local rumor has it that Brazilian television star Xuxa purchased all the surrounding homes and pousadas at Praia Ferradurinha. But we checked out the story and it’s just that – a rumor. 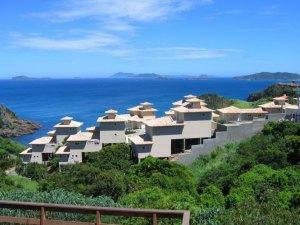 Yes, it’s magnificent, and we’re sure Xuxa has been here, but the homes here are not for sale. Who would part with such a view for any money? Ferradurinha Beach in Búzios is perfect for families. And if you’re into snorkeling, this is one area we have actually snorkeled. There is some marine activity along the rock cropping – visibility to about 30 feet. We didn’t see any coral at the time, though starfish and sea urchins are a local fixture. Close by Ferradurinha is the smaller still Praia dos Amores. The only way to get to these secluded beaches is on foot from Ferradurinha, or down one of the roads in the new Enseada do Albatroz development. Albatroz is getting quite crowded with new homes popping up every day. You can check out the action by driving east out of the Ferradura neighborhood. Sand – medium grain, no coral or shell. Groomed daily. Facilities – none, but local snack shack. Shade – none, except late afternoon – beach faces south, umbrellas available. Notes – nice walk from Geribá Beach, or enter by car through Ferradura neighborhood.